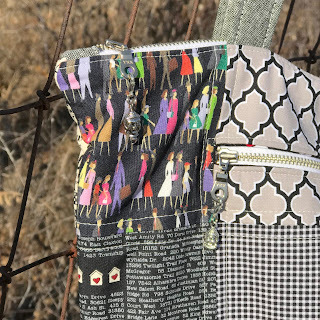 If you haven’t heard of Project Quilting, stop what you’re doing and click here. Actually, finish reading this first. 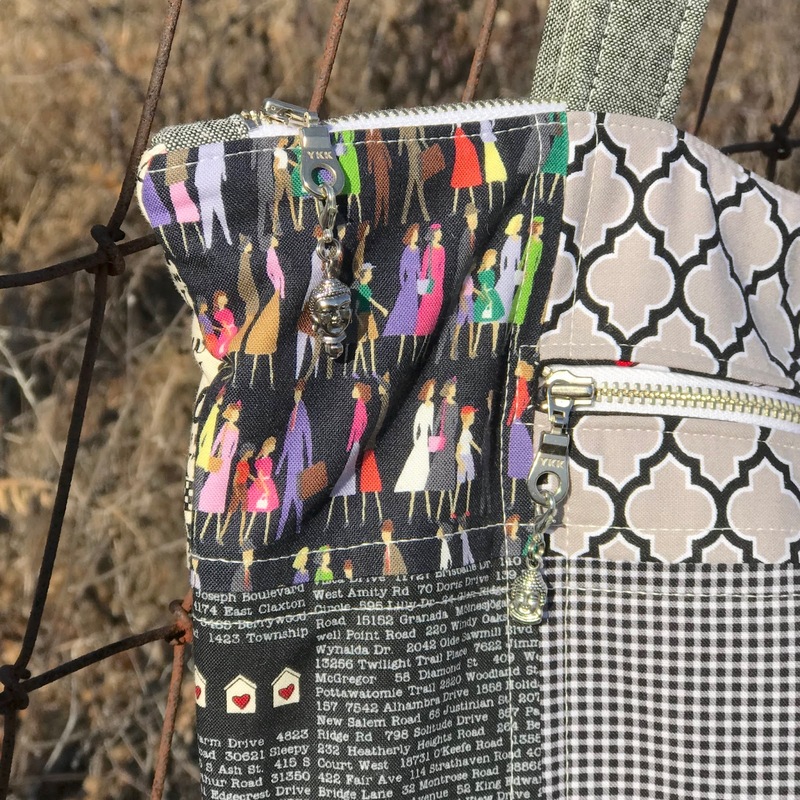 Project Quilting is an awesome, annual, short season of quilting challenges for which you have one week to start and complete a project for each challenge. My friend, Kim Lapacek, at Persimon Dreams started it nine years ago. It has grown over the years, and she’s gathered awesome sponsors who give prizes to random winners for every challenge. Our friend, Trish “Quilt Chicken” Frankland is now Kim’s Project Quilting co-hort, and she comes up with the challenges. I was one of the lucky random winners for the first challenge this season. Look at the awesome scissors I won from Warm Crochet!! Aren’t they gorgeous? They’re also super sharp and functional. This season kicked off on January 7th with “Hometown Proud” as the first challenge. My favorite thing about Project Quilting is that you don’t necessarily have to make an actual quilt to participate. A handmade object that includes quilty attributes can also work. See any of the PQ Challenge posts at Persimon Dreams for the actual rules. 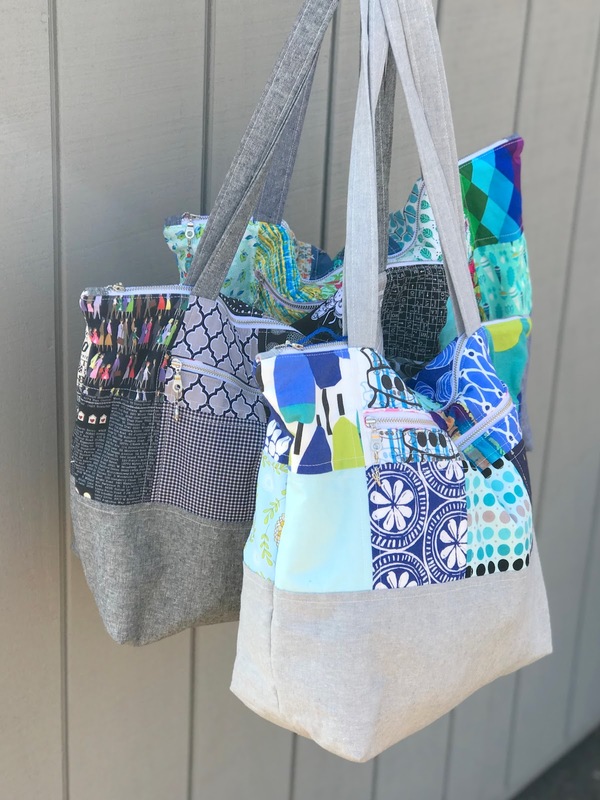 I made three quilted bags for the first challenge. 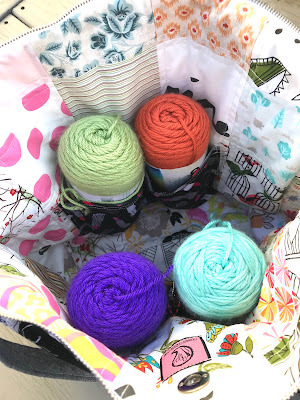 Two of my friends and I are knitting temperature blankets this year, so I thought we could each use a nice big project bag. 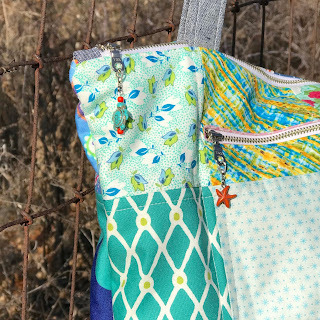 Coincidentally, my friend, Natalie Santini, over at Hungry Hippie Sews was looking for some help testing one of her patterns: the Santorini Tote. I thought this pattern would make an excellent big-knitting-project bag, so I went for it. I pieced the top half of the main panels for the bags with charm squares from my group of "Strip Poker" players mentioned in my last blog post. I'm always looking for ways to use the strips and charms that I take from my fellow fabric gamblers!! HA! The bottoms of the panels (and straps) are Essex Linen. Everything I used for the bag was from my stash, except the zippers. 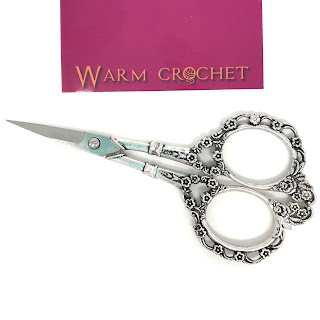 I ordered those from my favorite zipper supplier: Zipit Zippers on Etsy. 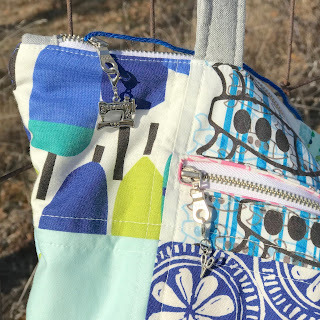 To make the bag extra perfect for a knitting project, I added some pleated pockets on the inside to hold yarn and a grommet through which to feed yarn, so it doesn’t get chewed up by the zipper teeth while we’re working on our blankets. And how about those cool zipper charms, eh? 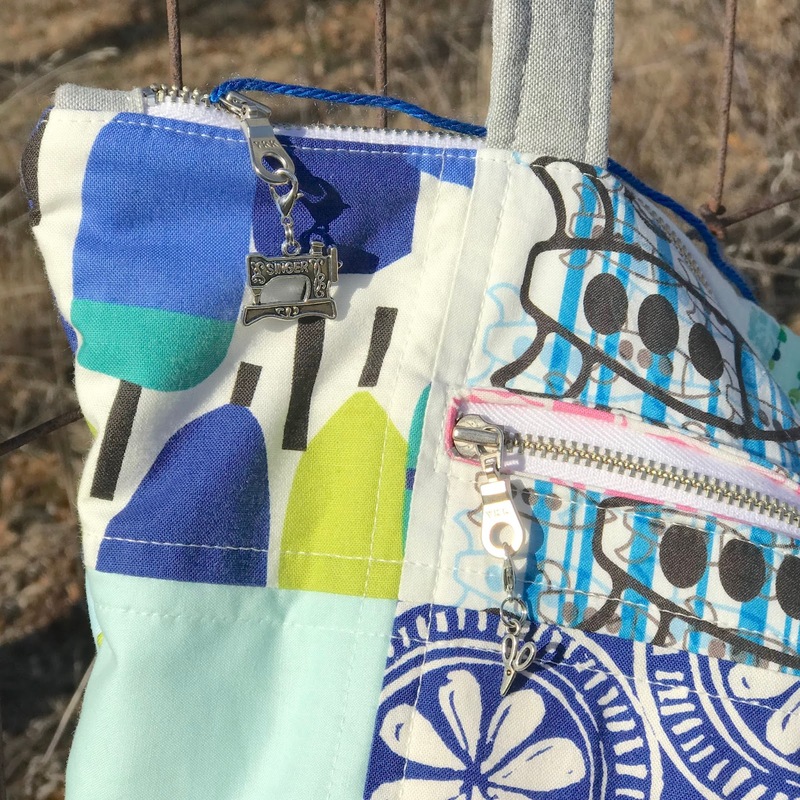 You can find plenty of those in my Etsy Shop for your own zipper projects. They also work well as row markers! I used two layers of batting instead of the foam interfacing that one would usually use for the Santorini Tote. I chose to use batting, because I’ve never quilted on the foam. Normally I’d be up for trying something new, but I wanted these bags to look great since two were going to be gifts. As a result, my bags are a little floppy, but I love them for their intended use. They work great. The Santorini Tote is an amazing pattern, and it includes two sizes. I made the smaller one for the knitting project bags, and I plan to make a large one (with foam) for travel. Get the pattern here. 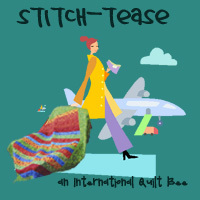 Follow Persimon Dreams to join in the Project Quilting fun! If you’re not a quilter, you can still play along by voting on your favorite projects during the week following each challenge. Here is the first month of my two temperature blankets. I'm doing one for my new hometown in Walworth, Wisconsin and one for Calais, Maine, where I grew up. Each of my two boys will get to keep one at the end of the year when they're done. I'm excited to see how these two similar climates differ throughout the year. I think Walworth is a tad warmer with a slightly longer warm season. Good thing, too, because I LOVE it here! !